What to expect from Orthodontic care. It is more important than ever to brush and floss regularly when you have braces. This is to ensure that the teeth and gums are healthy after orthodontic treatment is completed. Patients who do not keep their teeth cleaned may require more frequent visits to the dentist for a dental professional cleaning. Adults who have a history of gum disease should also see a Periodontist during treatment. When you get our braces on, you may feel sore in your mouth and teeth maybe tender to biting pressures for three to five days. Rinsing our mouth with cold water can relieve this soreness, because wires are thermal activated. If tenderness does not subside, take a pain killer that you would normally take to a headache or similar pain. The lips, cheeks and tongue may also become irritated for one to two weeks as they toughen and become accustomed to surface of braces. You may also put wax on braces to lessen this. This is to be expected throughout treatment. Don’t worry! This is normal! Teeth must loosen firs so that they can move. The teeth will again become rigidly fixed to their new- corrected- positions. If you play sports, it is important that you consult dentist for special precautions. A protective mouth guard is advised for playing contact sports. In case of an accident involving the face, check your mouth and the appliances immediately. If teeth are loosened or the appliances are damaged, phone at once for an appointment. In the meantime, treat your discomfort as you would treat and general soreness. 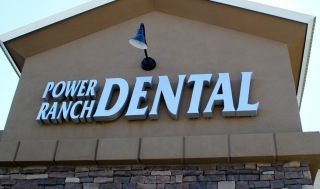 If you have any other questions or concerns regarding orthodontic home care, please give Power Ranch Dental a call at (480) 988-2282.